[I]t is incumbent on those in high positions to reach wise decisions, and it is reasonable and important that the public be correctly informed. It is incumbent on all of us to state the facts as forthrightly as possible. Q3. Of the six Gen IV nuclear power technologies proposed by the US in 2000, DOE Idaho National Labs have been pursuing two - (1) high temperature gas-cooled reactors for hydrogen production, and (2) sodium-cooled fast reactors for waste burning. Separately, liquid-fluoride thorium reactor research is ongoing at UC Berkeley, MIT, Redstone Arsenal, and in other countries including France, Japan, and Canada. As the Department analyzes advanced reactor designs, can you tell me if the liquid-fluoride thorium reactors are under consideration? What are the benefits of liquid-fluoride thorium reactors? What are the drawbacks or downsides of liquid-fluoride thorium reactors? How does power generated from liquid-fluoride thorium reactors compare, on a price per kilowatt hour, with power generated from the current coal generation fleet in the United States? As we confront our nation's energy and climate challenges, what role might these types of reactors play? A3: The "liquid-fluoride thorium reactor," otherwise known as a molten salt reactor (MSR), where molten salts containing fissile material circulate through the reactor core, is not part of the Office of Nuclear Energy's research program at this time. Some potential features of a MSR include smaller reactor size relative to light water reactors due to the higher heat removal capabilities of the molten salts and the ability to simplify the fuel manufacturing process, since the fuel would be dissolved in the molten salt. One significant drawback of the MSR technology is the corrosive effect of the molten salts on the structural materials used in the reactor vessel and heat exchangers; this issue results in the need to develop advanced orrosion-resistant structural materials and enhanced reactor coolant chemistry control systems. In addition, operational practices would have to address the fact that the liquid salts solidify between temperatures of 300 C to 500 C, thereby requiring the use of special heating systems when the reactor is not operating. From a non-proliferation standpoint, thorium-fueled reactors present a unique set of challenges because they convert thorium-232 into uranium-233 which is nearly as efficient as plutonium-239 as a weapons material. A cost per kilowatt hour estimate has not been developed. As a result of these studies, we have found that Hastelloy N exposed in salt containing metal tellurides such as Li Te and Cr Te undergoes grain boundary embrittlement like that observed in the MSRE. The embrittlement is a function of the chemical activity of tellurium associated with the telluride. The degree of embrittlement can be reduced by alloying additions to the Hastelloy N. The addition of 1 to 2 % Nb significantly reduces embrittlement, but small additions of titanium or additions of up to 15% Cr do not affect embrittlernent. We have found that if the U(IV)/U(III) ratio in fuel salt is kept below about 60, embrittlement is essentially prevented when CrTel.266 is used as the source of tellurium. The nickel-based alloy Hastelloy N, which was specifically developed for use in molten-salt systems, was used in construction of the MSRE. face cracking when exposed to fuel salt containing fission products. W ~ S under way at the close sf MSRE operations. salt, on the grain boundaries. ceeded sufficiently to show that a modified Hastalloy N containing about 1% niobium has gosd resistance to tellurium attack and adequate resistance to thermal-neutron embrittlernent at temperatures up to 650°C. It was also found that alloys containing titanium, with or without niobium, exhibited superior neutron resistance but were not resistant to tellurium attack. The secund likely solution involves the chemistry of the fuel salt. by the ratio of U4+ to U3+, is less than 60, the possibility that the superior titanium-modified Hastelloy N could This discovery opens up be used for MSRs through careful control of the oxidation state of the Fuel salt. in the design of a future MSR. operated throughout its lifetime with denatured uranium. The designation DMSR (for denatured molten-salt reac- tor) has been applied to both of these concepts because each would be fueled initiallyith 235U enriched to no more than 20% and would be operated throughout its lifetime with denatured uranium. line chemical processing of the fuel salt for removal of fission products. ing of the old unit. special step would be added for removal of fission-product zirconium. For those of you who have read through all of the texts reported here, no futher comment is necessicary. I tried to locate Dr. Chu's testimony to Congress from which Senator Shaheen's queestion Q3 was taken but was unable to locate it. Could you provide a link or reference that would help the rest of us to find this exchange between Dr. Chu and Senator Shaheen? I looks like the DOE Secretary may be just a little behind the power curve on awareness of the current state of LFTR development. friend2all the source was Trent Bauserman, an aide to NH Senator Shaheen. 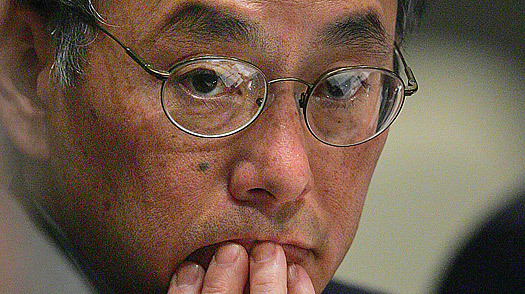 The senator had sent the question on the LFTR to Secretary Chu, and Secretary Chu offered the responce attributed to him. Tbhe responce was then passed on to Robert Hargraves by Bauserman in the form of a Word Document with embedded image.